Neway Stamping flawlessly combines skill with science to deliver parts that range from simple to complex. Relying on our eye for design, the science of engineering and our proprietary processes, we work together to understand your needs and deliver to spec. Our engineers give feedback on the manufacturability of each part and then create unique engineering processes that utilize the most efficient, cost-effective methods to provide you the highest-quality products available on the market. No run is too small. Our unique press fixturing, proprietary short run processes and in-house tooling make us a leading provider of short run industrial stamping services. Rely on high-quality finishing and assembly services that help you meet your complex demands. Whether your jobs require some assembly or parts and products that need quality finishing, we can save you time and money from start to finish. Our in-house tooling guarantees consistent quality across jobs and the accuracy you demand. 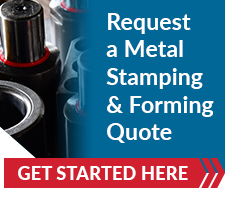 As your stamping partner, we ensure our process delivers parts to spec – while helping you meet demanding deadlines. Did your tooling break or malfunction? No need to worry. Unlike our competition, we have a fully staffed in-house tool room to ensure all tools are properly maintained and repaired when needed – at no additional cost to you, which yields significant time and cost savings. Our highly experienced on-staff engineers have helped design and manufacture more than 20,000 unique parts, which means they’ve seen it all. As a result, our customers have come to rely on their expert feedback to improve designs, processes and overall part quality. Prototyping further guarantees part quality. Every new part we manufacture is first prototyped to ensure quality and complete customer satisfaction. After prototypes are perfected, parts are then sent to production to be manufactured with the same attention to detail that’s been our hallmark for more than 40 years. Thickness range: 0.002" to 0.312"
Size range: From 0.100" x 0.100" to 15" x 24"
When quality, timeliness and reliability matter most, we’re your ideal metal stamping partner.